The Mobile Steam Distillation (MSD) process is an economical and environmentally safe alternative for the treatment of soils which have been impacted by hazardous or non-hazardous compounds. MSD is an ex-situ process that uses steam and pressure to remove contaminants from soil or other waste material. This is a physical separation of the process (volatilizes and/or mobilizes), and is not specifically designed to destroy the contaminants. The performance of the MSD system is measured by the reduction in contaminant levels. Contaminated soil is placed in processors and then sealed. The MSD Unit is mobilized to the project site and the contaminated soil is placed into the unit’s sealed processors. The processing trailers consist of four sixteen (16) cubic yard processors (two on each 45 foot trailer). Pressurized steam is injected, mobilizing contaminates. Steam is generated by a steam generating unit, (located in the control trailer), and is injected into each of the processors. The pressurized steam, by virtue of the proprietary design of the processors, passes through the soil matrix and mobilizes the contaminants with the combined action of temperature and pressure. The steam can be directed to travel different paths through the processors, depending on soil type and conditions as well as type and quantity of contaminant. Some of the steam condenses and collects in a void space below a porous floor. This steam, along with a portion of the contaminants, flows into a condensation tank. Steam/contamination mixture is condensed into a liquid, eliminating air emissions. No discharge of contaminated liquid occurs. The remaining steam/contaminant mixture passes through air-over-coil heat exchangers and condenses into a liquid. All condensed steam is then pumped through a set of filters, either standard micron level particulate filter bags, oilphilic filtration media, activated carbon, other appropriate filtering media or any combination of the above. Entrained air is released, and the contaminants are retained in the filtering media. There are no emissions due to the degree to which the steam is condensed, filtered and reused. No discharge of contaminated liquid occurs. 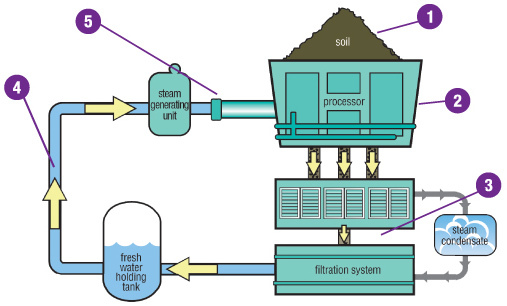 Filtered condensate is pumped back to the freshwater holding tank to re-supply the steam generating unit and complete the closed-loop process. The filtered condensate is then pumped back to the fresh water holding tank where it is used to supply the steam generating unit and complete the closed loop process. The treated (undamaged) soil may be returned to the excavation as fill or disposed of at an approved disposal facility. Soil is treated based on predetermined sampling requirements and the desired end use of the soil. Samples of treated soil are collected according to established guidelines and sent to an independent laboratory for analysis. After acceptable analysis results have been obtained, soil may be returned to the ground or disposed of as non-hazardous, whichever has been predetermined.